Quilt 11 is my own design - inspired by the majestic gum trees around our house. I have to be careful to explain, however, that my design shows American (or European) trees. Gum trees don't have leaves like the one in my quilt. 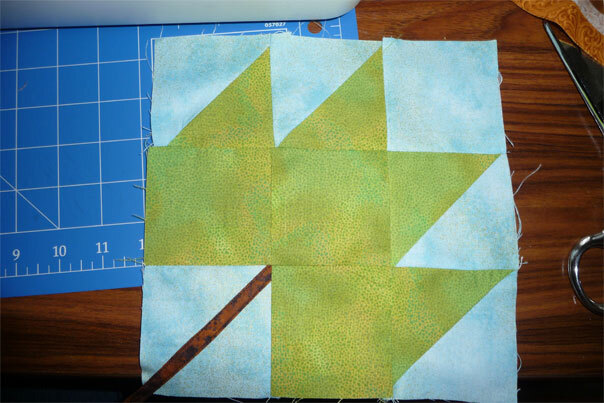 Eventually, I'll do a tree quilt using a more accurate leaf (it will probably have to be applique'd), but that's a future project. For now, here's what I'm working on. I bought the fabric - oh - AGES ago, and it's been sitting in my UFO closet until relatively recently. 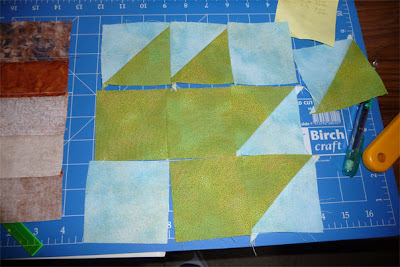 When I realized that I was coming to the end of the "Forbidden Palace" quilt, I knew I needed to get busy and prepare another project so that I don't end up without anything to quilt. So away we go. I've already assembled the blocks for the tree-trunks, and now am ready to assemble some of the leaf blocks which will represent the branches of the trees. 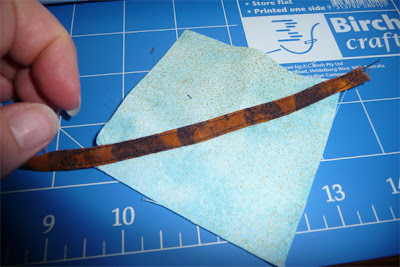 Now to position the strip on the sky-blue block that will go in the lower left corner of my leaf block and stitch it down. If you click the image below, a larger version will appear and you'll be able to see the stitching (in black thread) which holds the strip on the blue background. That's one down, 17 still to go (for the tree branches). There'll be other leaf blocks later, using various fabrics, for the undergrowth beneath the trees. In the "Forbidden Palace" quilt, I opted to try using bamboo batting (yeah... you read that right) instead of polyester, cotton or wool. The gal in the shop said it's a nice, light batting, easy to pass a needle through, and the resulting quilt is a little cooler than it would be with other fabrics (here in sunny, hot Australia, cool quilts can be a good thing). Below is a photo - click the photo to get a larger image, and you'll be able to see the fuzz.. The back of my Forbidden Palace quilt is solid black cotton - and it's covered with dusty fuzz which I know is from the batting. 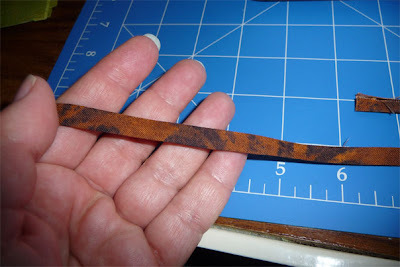 Now I Remember What the Whatchamagigger Is For! I bought it at a local quilting shop and, at the time, thought it was just the dandiest thingo. But then... I forgot what it was for! But now, I remember! 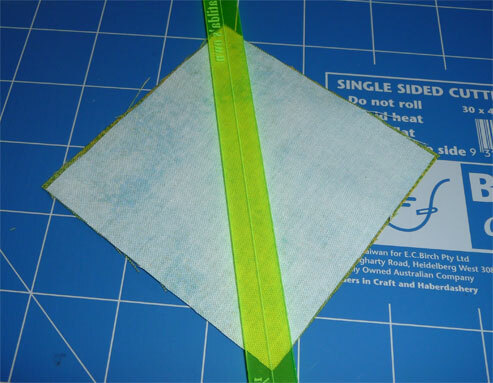 It's for those times when you need to make triangle-blocks using two squares. 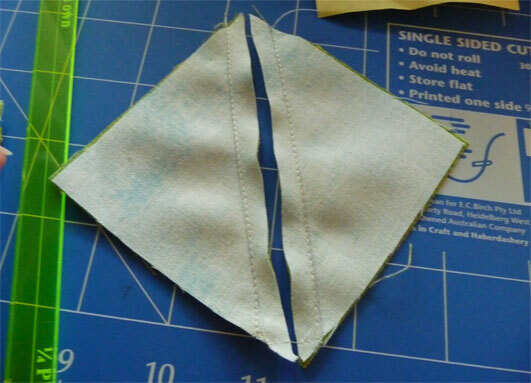 2 square blocks made of triangles - easy as pie. EASIER! 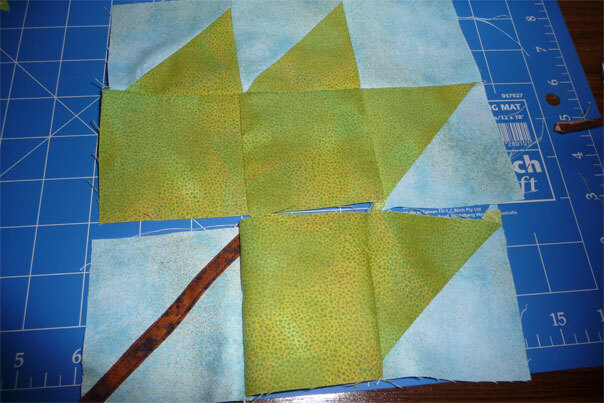 So I've got the 20 "tree trunk" blocks done and finally settled down to start on the leaf blocks. 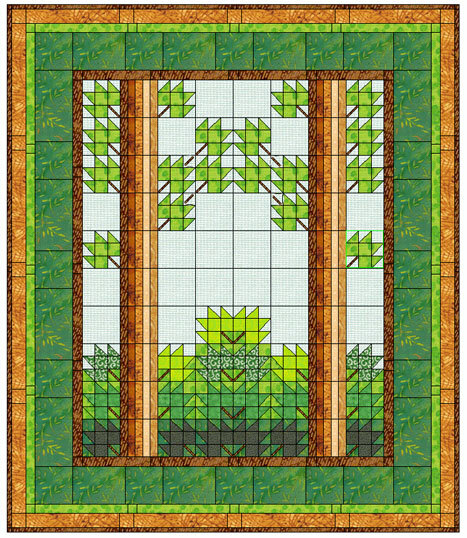 I had a little "Post-it" note on which I'd written the dimensions for the pieces needed to assemble one leaf block, but had mislaid it, so I just opened up my quilting software and looked again at the calculation. I started cutting the pieces out but quickly had the feeling something was wrong - and then I glanced down and found that mislaid Post-it. Which one is right? The Post-it! I don't know how it's happened, but the quilting software has somehow recalibrated the quilt top for smaller blocks than I originally set it for. Thank heavens I didn't get too far into this. I've still got loads of the blue and green prints involved - I bought more than I needed, I'm certain, so I can pull this one out of the fire. Have to admit, however, that the room spun for a minute.